Any basic SCUBA class will tell you that the primary consideration when buying gear is fit. If it does not fit right, it will not function properly. The best example is the simple SCUBA mask. If it does not fit, it will leak, and fill with water. This not only defeats the purpose, but also adds a great deal of stress to the diver. Make sure your gear fits! After fit, here are some other considerations you may want to keep in mind when making gear selection. Intended use: Ask yourself a serious question: what type of diving will you be doing in 5 years? Your SCUBA gear will easily last that long. I still regularly dive the first SCUBA regulator I ever bought. Many fall victim of short sighted purchases. Then every few years, they sell all their gear, and buy gear that is better suited to the diving they are doing now. Marketing claims: The newest or most expensive model is not always the best choice. Manufacturers are constantly trying to separate themselves from the others. There have not been huge changes in SCUBA technology in the last few years. Improvements in manufacturing practices have reduced the cost to make the gear, and exotic materials have made some of the gear more rugged. However, despite marketing claims, the basic function of the gear has not changed significantly. Local Conditions: Ask a few local divers, or instructors, what type of gear they use and why. There are a few pitfalls to this approach. If their answer is one of the following, “it was a deal”, “someone else recommended it” or “That’s what our shop sells”, then look for another source. Keep in mind that shops recommend what they sell. That does not mean its the right gear for your local diving. Check out the diving experience of the shop owner (the one who purchases the gear). Make sure their diving matches your plans. If not, then the gear may not be suited to your diving conditions. A good instructor will usually be upfront, but some are affiliated with a shop, and will promote the shop’s gear. Experienced divers will get the right gear for the job. Find out what it is and why. Shop for features not brands: When talking with other divers, ask about the features they look for in the gear. During these discussions, leave the brand out of it. Most brands offer similar features. Or put another way, the features you’re looking for are probably available from several brands. The important part is to determine which features are important, and which are not. Some features, highly touted by the marketing types, may be a detriment in your diving conditions. Make a list of the features you want before stepping into the shop. Service: Some brands provide fantastic gear, but have very few locations for service. Quality: Some brands have better manufacturing processes, and produce gear with better fit and finish. Reliability: This often has to do with the quality of the materials used in the gear, and the quality of the engineering that went into it. Simple is usually more reliable. Price: Why is this last on my list? Simple, if you have not chosen good gear, then getting a good deal, is no deal at all. I hope the above discussions will prevent you from purchasing the wrong gear, or falling for the marketing claims and purchasing unnecessary bells and whistles. If you can avoid those pitfalls, then you should have saved enough money to buy the right gear once. Do you ever see sharks? The most common, or plentiful, shark in the Atlantic only grows to a length of 4-5 feet (more commonly seen at 3 ft). They are called sand sharks or Spiny Dogfish. They can be seen around the wrecks either alone, or in small groups. Are they a threat? No. I don’t believe there has ever been an unprovoked attack on humans. Do we see other sharks? Yes, but far less frequently. Further off shore we will occasionally see basking sharks. These are filter feeders, and no threat, but with their large size, they startle you at first. Other divers have reported seeing Blue sharks, and Mako sharks. Some things to keep in mind. The incidence of shark attacks on divers is very low. Most shark attacks are in shallow water in the surf zone (beach), with limited visibility. Most divers are in deeper water, with good visibility. In recorded history, there have been only a hand full of attacks in New Jersey. None of these have been on divers. What do you see diving in New Jersey? The short answer is shipwrecks. Here on the east coast we do not have the rocky shore and bottom found on the west coast. Our shore line is mostly sand, and for the most part the bottom is sand also. The continental shelf slopes out for 60+ miles before dropping off sharply. Sand and silt that washes out of our rivers and streams has deposited in this shallow area for thousands of years. This sand does not provided shelter for fish or secure footing for large plants like kelp. The sand does provide a home for clams, scallops, and sand dollars, but the more interesting areas to dive are the shipwrecks. There are an estimated 4000-5000 shipwrecks off the coast of New Jersey. (Many people are taken back by that statement.) Keep in mind that we have the port of New York to the north, and the port of Philadelphia to the south. Over the past 300 years there have been thousands of accidents in these waters. Further, during two world wars, the German submarine force spent a significant amount of time trying to stop the flow of supplies from the US to Europe. Many ships were sunk just miles off our beaches. The older wrecks of wooden ships have been slowly eroded by the forces of nature. Storms, sand, rot, and marine invertebrates have nearly erase them. Still left are the stronger structural beams along with the anchor chain, and machinery used to lift it. New steel ships quickly fall victim of rust. Many of these ships are now jumbles of steel rubble and hull plates strewn on the sandy bottom. Again stronger or reinforced portions of the ship hold up better with time. Engines, boilers, propellers, and pipes are often recognizable. Metals like coper, brass and bronze stand up better to salt waters corrosive effects. Even in this state of decay, these wrecks provide shelter for marine creatures. Filter feeders like mussels, sponges and anemones attach to the wreckage for support. Lobsters and crabs burrow under the wreckage for protection. Schools if fish surround the wrecks. Some are looking for shelter, others are looking for food. How long can you stay underwater on SCUBA? The final question everyone asks. Unfortunately, there is no short answer to this question, and the usual response is: it all depends. After the strange looks, I start to explain some physics and physiology, and lose most people after a few sentences. Normally, 1 and 2 are the major limiting factors. When the original question is posed, it is usually referring to our gas limits, so let’s look closer at the factors affecting it. Without getting too deep into the explanation, lets just use a couple of generalizations. 1) The deeper you go, the less time you have. 2) The harder you work (underwater) the less time you have. 3) Different people consume air at different rates. 4) The bigger you are, the less time you will have. 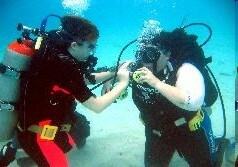 5) New divers will have less time than experienced divers. Numbers 1 and 2 are immutable facts. Numbers 3 – 5 are generalizations that vary greatly based on the individual, their physical fitness, and level of skill and comfort in the water. Just to throw a wrench into the works, we must also consider the size of the tank. As discussed before, different tanks carry different amounts of gas, and can allow us to stay longer. Let’s consider an average dive (not working hard), by an average diver at an average depth (60 ft) with the average tank (Aluminum 80). In general this diver should have gas to dive for about an hour.